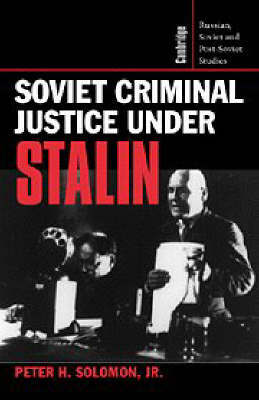 Soviet Criminal Justice under Stalin, first published in 1997, is a comprehensive account of Stalin's struggle to make criminal law in the USSR a reliable instrument of rule. Using recently declassified archives, Peter Solomon tells the revealing story of non-political justice, on the local scene as well as in the center. Contrary to conventional wisdom, Solomon emphasizes the initial weakness of the Soviet state and the limits of Stalin's capacity to rule. Solomon's study also offers new perspectives on collectivization, the Great Terror, the politics of abortion and the disciplining of the labour force. This book should appeal to anyone interested in the political, social, or legal history of the USSR, judicial reform in post-Soviet states, law in authoritarian regimes, or comparative legal development.